I am SO super excited to share this project and tutorial with you! I created this project for my Random Acts of Kindness Art class and students enjoyed it so much that I created it as a tutorial. 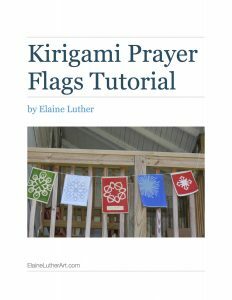 Purchasing this tutorial gives you, the teaching artist, the rights to teach this yourself! It’s low cost, uses up-cycled materials and students are successful! Students really enjoy it! It’s 33 pages, with 114 photos! Famous Headstones of Forest Park Scarf, with model. Scarf copyright Elaine Luther 2016. 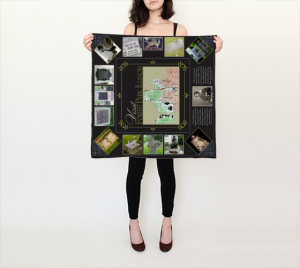 Famous Headstones of Forest Park is something I made in the style of a souvenir scarf and it has amazing stories in it. You can read all about it in this post and buy it here. 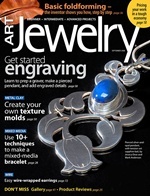 Jewelry Photography: You Can Do It! 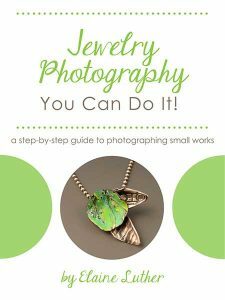 How to set up the lighting and use a point and shoot camera to take great photos of your handcrafted jewelry or other small objects. Need to document your jewelry with DIY photography at an affordable price? This booklet teaches you how to set up the lighting perfectly, affordably and is all about taking great photos with a point and shoot camera. No DSLR required. Includes an interview with a professional photographer on how to work successfully with models and what goes into a model photoshoot. With this guide, you’ll know how to take great photos of your handcrafted jewelry (or other small objects) to use to apply for shows and use online. 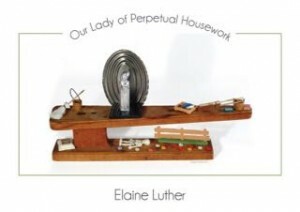 Our Ladies of Perpetual Housework is series of small shrines are my plea for help and my complaint about housework, dishes, homework, laundry, driving and more… You can see all the images and items that are available in my Red Bubble shop, here.